With David’s travel illness combined with incessant rain showers, we were never able to hike Arenal. 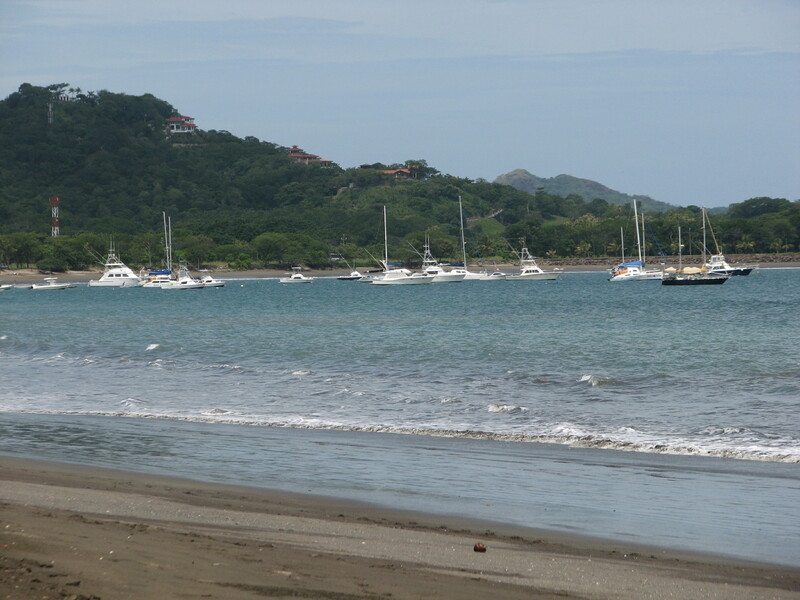 Instead, we continued with our plan to pick up a rental car and head to the Guanacaste region of the country, an area that is known to be both drier and hotter than other parts of Costa Rica. This means we’re leaving our first real appearance of rainy season behind us just in the nick of time—and heading toward never-ending summer. Our destination: a sleepy little beach town named Potrero, which is north of the more well-known (and more touristy) Tamarindo. Potrero is near some good paddleboard areas and is where we’ve arranged to rent a studio a few blocks from the beach. This is the first time we’ve actually driven in Costa Rica, so it seems like an opportune time to say a thing or two about Costa Rican roads, road signs, and…well, just a few general nits and grits about getting around. On the positive side: Costa Rican drivers are, for the most part, very good compared to other Latin American countries I’ve visited. You might occasionally see a misconception about the proper use of a turn signal and a whole lot of crazy passing, but the latter is partly due to the fact that most roads tend to be single lane, so there aren’t many choices when you’re behind a slower vehicle. On the negative side: A high percentage of the roads are unpaved. According to one source, there are “over 23,000 miles of road in Costa Rica, and fewer than 5000 of them are paved.” I didn’t quite understand this until we left San Jose and I saw just how true this is. The entire town of Ojochal (which is the nearest town to where we volunteered), was completely unpaved, even though it had several hotels and a few highly rated restaurants (i.e., definitely a place where people go). Potrero, where we are now, is also unpaved. This general lack of pavement is why many car rental agencies stock a lot of 4x4s. The first street signs we’ve seen in weeks. These are in Liberia. Okay, I’m going on about roads and haven’t even gotten to the other stuff. Like road signs…or the lack thereof. 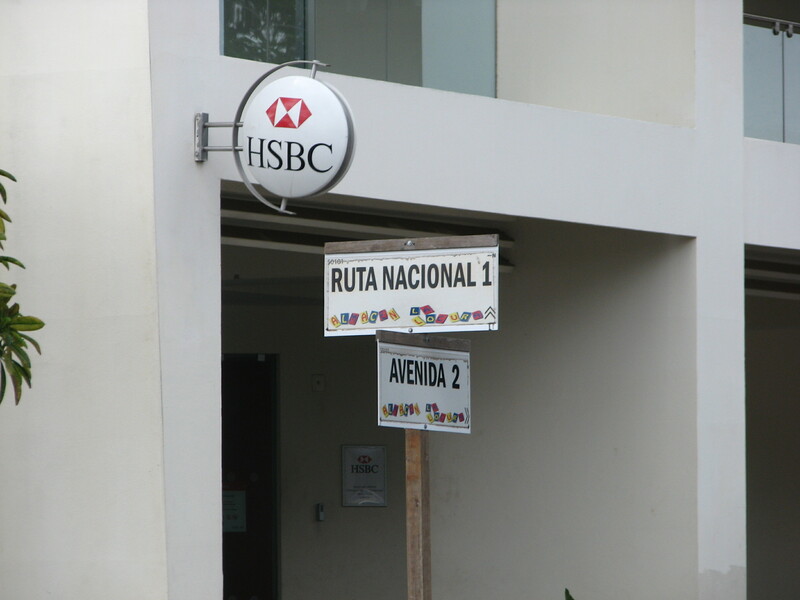 I have a theory that Costa Ricans (or Ticos, as they call themselves) have super-sensory internal GPS that renders road signs unnecessary (it must be a genetic thing). I remember noting that San Jose has a map with road names on them, but I saw only one or two road “signs” (actually, it was just the name painted on the side of a building). After that…nada. I asked a shopkeeper what road her shop was on and she had no idea, if that’s any indication. Once you move out of the city, things get sketchier. When I asked the woman from whom we’re renting the studio what the address was, she gave me coordinates because there are no signs. Knowing this, she offered instead to meet us at a nearby bar so she could lead the way. It wasn’t until we drove through Liberia on our way to Potrero that I saw my first actual road signs…the first I’d seen in almost three weeks. Then there are the names of towns. There is more than one Potrero, Ojochal, and four Platanillos, etc… since this can get confusing for those of us who weren’t born with that special super-sensory internal GPS, these duplicates require extra qualification (e.g., Potrero in Guanacaste). All of these things make for some very interesting navigation, or at the very least, keep the gringos on our toes and constantly searching for other ways of navigating (e.g., “take a left at that supermercado…”).